Julia Barnett has been acting since she was a teenager, most recently playing a recurring role on ABC’s Nashville and a role on Lifetime Network’s The Preacher’s Mistress. Her latest project, however, is her most personal. It took her more than ten years to complete and carried her though a journey of frustration and forgiveness. 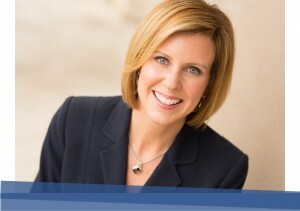 Using what she knows best – film – she’s sharing some of her story with others who have struggled with family relationships impacted by divorce. Inspired by her own life story, Julia wrote, produced, directed and acted in a short film called Chasing Grace that was shot in Dripping Springs, Texas just outside of Austin. 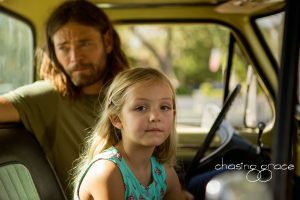 The movie depicts a little girl living in the uncertainty of divorce in the 1970s and follows the girl into adulthood when she recalls the memories of her parents’ split and the decisions they made. Julia walked a similar road in her off screen life and hopes people who have divorced parents will see the film and see the good in working to restore strained family relationships. “If we can find room to forgive our parents for the choices they made, then there is a possibility of a relationship,” said Barnett. 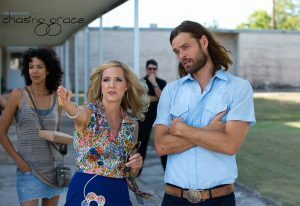 Chasing Grace explores lifestyles of the 1970s and features all the members of Julia’s family. Her daughter, Lydia Tracy, stars as the young girl caught in the middle of divorce. The cast also includes Julia’s husband, Van Tracy and son Zander. Christopher Backus of Underground (2016) and Roadies (2016) stars alongside Jolie Vanier known for Shorts (2009) and From Dusk Till Dawn (2016). In the more than ten years Julia worked on what would become the Chasing Grace film, she had her two children and worked on various other projects. Other than acting, she is the International Operations Director for the African Children’s Choir. (That position started with a volunteer trip to Africa and turned into what she calls her God given mission.) Through all of it, the drive to create a film about her story kept coming back. “If you can’t let go of an idea, you have to get it out,” said Barnett. Look for her short film to be out at film festivals soon.